Spending a dreamy weekend up north with friends. Baking near-perfect scones with the help of home-grown raspberries, America's Test Kitchen, and plenty of teamwork. Stopping at a midnight release party for the new Harry Potter book. Enjoying Musical Mondays in Lake Park. Shopping local at The Waxwing and Sparrow Collective. Going to a barn party and visiting with Shadowfax. Kicking off theater season with the Milwaukee Rep.
Tarot readings by Barb Meyer, rosé, banana cake, jumbo jars of Nutella, and so much more for Rachelle's 30th birthday. Creamy, lemony, classic — something for everyone! Labor Day is this weekend — the unofficial end of summer. Or at least the end of wearing white or whatever. Don't cry into your paper plate at the family barbecue — pour your feelings into summer's comfort food! Here are three pasta salads perfect for sharing with a group. Or, yoe know, eating alone in your end-of-summer depression. This recipe is my friend Fritz's go-to party salad, except she uses orzo. I couldn't find orzo at the time, so I opted for small shells. The rest of the ingredients remain the same: tomatoes, garbanzo beans, red and yellow grape tomatoes, basil, mint, feta, and spinach. I love this recipe for being fresh, light, and lemony. To make this salad a more hearty meal, add some chopped grilled chicken. Creamy deliciousness chockfull of carrots, peas, bell peppers, tomato, cheddar, and salami. This is the ultimate comfort pasta salad, and the dressing is perfect. The original recipe from Pinterest was called Mom's Macaroni Salad, but I subbed large shells. You can't help but binge this one, so proceed with caution! 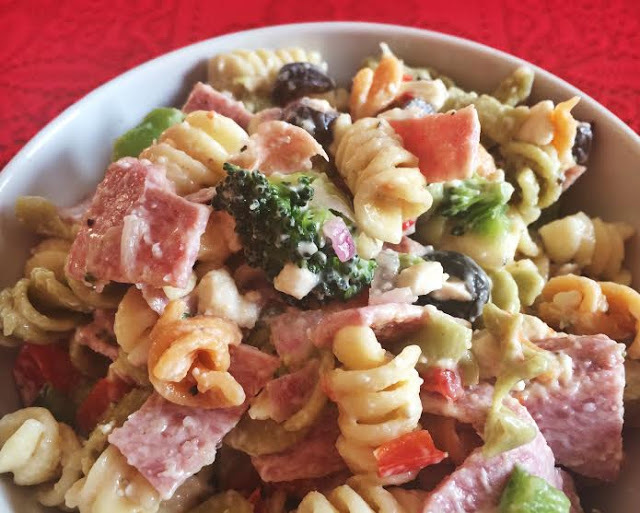 If you're looking for a classic recipe with corkscrew noodles, peppers, red onion, black olives, salami, broccoli, and feta, this is the pasta salad for you. I have my Aunt Kathy to thank for bringing this beautiful bowl of deliciousness into my life — it's been a family favorite for years. I love how easy the dressing is: bottled! 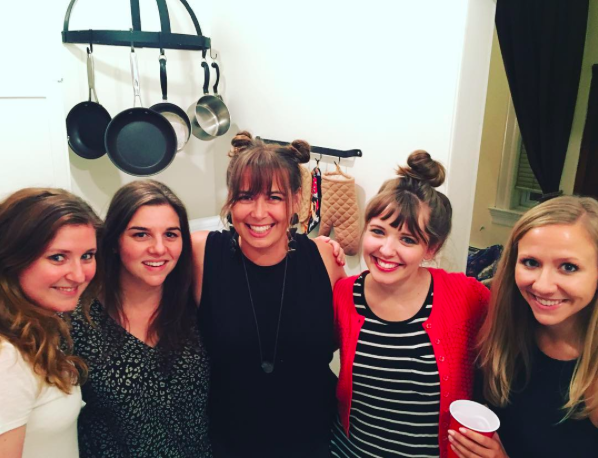 What is it about turning 30? It's kind of a big deal, right? Well my bestie Rachelle (Roach) is kind of a big deal in my world, and she turned 30 this weekend. So that's like a big deal squared. We threw a shindig for Roach in Chicago at our friends Jess & Rob's adorable apartment and had an absolute blast — and ingested an insane amount of food (shout out to Rob the Burger Master!) and rosé. Then there was Madame Zandra, AKA Barb Meyer, Chicagoland tarot reader extraordinaire, who we hired as a birthday surprise. Barb's a chatty one. She doesn't (and I quote) "do dead people." She told more than one of us things like "you need to compromise" and "tick tick" — in reference to our biological clocks. We smiled and nodded and chuckled and then said "but actually, she wasn't wrong about anything..." And then Barb snapped a timed picture with the whole gang so her mystical presence can live on in photographic infamy. To walk off brunch (and the pre-brunch cake), we bummed around some shops in Jess & Rob's neighborhood (which, by the way, is #goals). I could have spent all day in this one store called Art Effect. It had giftables, cards, dishes, kitchen goodies, fun clothes and jewelry, and Chicago merch, too. Drool. It's probably a good thing I don't live within walking distance to such a wondrous place. During our little jaunt back to Jess & Rob's apartment, we also passed the above window. In which: A cat was dozing in a cardboard box lid next to a fallen toy dinosaur and a scotch tape note saying "Welcome to Jurassic Park." Doesn't get much better than that. But now I'll leave you with something we heard about what happens in your thirties — and all you thirty-somethings can tell me if it's true: In your thirties, you can finally just say no. Discuss. And offer up all your other wisdom in the comments please! There's a whole string of 30th birthdays still to come this year, and we need all the advice we can get. Last year I was a proud member of the Milwaukee Repertory Theater's social media club, and this year I'm going for a repeat. To kick off theater season (my favorite time of year! ), the club members were invited to a meet and greet for the Rep's upcoming musical Man of La Mancha. Much like last year's reception for Dreamgirls, there were short speeches and video presentations, like a Man of La Mancha review by my new favorite person on youtube Iain Loves Theater. The Rep chose Man of La Mancha in keeping with their mission: "Ignite positive change in the cultural, social, and economic vitality of the community by creating world-class theater experiences that entertain, provoke, and inspire meaningful dialogue among an audience representative of Milwaukee’s rich diversity." Artistic Director Mark Clements said that the great thing about having a mission is that it keeps you on track, and their fall musical certainly fits the bill. Man of La Mancha is a story about putting rights back into a world full of wrongs — a sort of call to social activism. I've never seen the show or heard much of the music, but you can learn all about it on the Rep's website. But even with the little I know about Man of La Mancha — that it's a musical telling of Don Quixote, written in 1964, and won five Tony awards — the talent alone is enough to draw me into this Milwaukee Rep production. The cast had only its first rehearsal on the day of the meet and greet, but Nathaniel Stampley and company are tremendously talented. I can't wait to see what weeks of rehearsals reveals. Man of La Mancha runs September 20th – October 30th, 2016. Some dates are already sold out, so get your tickets now at milwaukeerep.com! A couple of my dear friends are moving away this week — to California, to be exact. I knew I had to leave them with something from The Good Land, so I went to The Waxwing to see what I could find. The shop at the corner of North and Oakland has so many perfect Wisconsin- and Milwaukee-themed gifts of all shapes, sizes, and price points. Here's just a handful of the goodies I spied. Colorful coasters — make your own set! Beer bottle candles — just find one that's a Wisconsin beer. A PBR-inspired pillow (and there are many other pillow designs). Small clay dishes for rings and things. Stacks and stacks of Wisconsin and Milwaukee art prints. Tiny, adorable, framed water color paintings. There are also post cards and stickers, paintings on rustic wood, more made-in-Milwaukee candles, tea towels with catchy phrases, t-shirts, necklaces with tiny brass charms stamped with "MKE," and so much more. Truly, if you're shopping for something to represent our home town or state, The Waxwing is chockfull of treasures! When you reach that point in life where a lot of your best friends have moved away, you're faced with keeping in touch however you can. Lots of people are into phone calls and face time, Facebook posts and Instagram tags — but I'm 80-years-old and prefer snail mail. That's why I think the Hallmark Gallery collection of blank cards is pretty perfect. I know I'm always touting boutique card shops like Soaps & Scents, Beans & Barley, and Etsy sites like Seas and Peas — and I truly do prefer to give my monies to locals and hand-makers. But if you must shop Hallmark, these are the cards to buy. Like I said, these cards are blank, so you can write whatever message you want. And they're fairly large so you can fit lots of life updates inside — love it! Though due to their shape and size, you will need extra postage (two stamps should do the trick). I also just straight-up love the art on these cards. Each piece has a story behind it, which you'll find on the back of each card. There are cards by up-and-coming college art students, 1920s drawings pulled from French fashion magazines, and archival prints from the Hallmark library. Some are lovely, others whimsical, others too cute to pass up. I came away with a whole string of cards to add to my collection. Like the snail mail nerd I am, I can't wait to send 'em! When you taste this pie, you might give me side-eye and say "This is an easy pie?" with one raised eyebrow. It's just that tasty. When my awesome-sauce coworker Blythe told me a few weeks back that key lime pie is her absolute weakness, I knew she had to have one for her birthday this week. I googled a bunch of recipes — some super involved and vegan, others calling for egg yolks — but when I found a simple one with rave reviews on All Recipes, the search was over. The All Recipes version even calls for a pre-made graham cracker crust, upping the easy factor even more. But graham cracker crusts are simple to make from scratch, so that's exactly what I did (thank you Sally's Baking Addiction!). I also topped off the pie with makeshift piped cream and a sprinkling of lime zest. I love whipped cream so much, I'd like to slather the entire top of the pie with it next time — though Adam says the dolloped way is "more elegant." I don't know about that, but I do know any amount of cream is a must! *Note: Make sure to buy more than 3 cups worth of condensed milk — it's sticky and stubborn, and it's a pain trying to scrape it all out of the can. I used regular — not light — sour cream. I found key lime juice in the non-refrigerated juice aisle. I used 4 limes total — 3 in the pie, 1 for the garnish. The number you need will depend on the size of the limes. 1. For the crust: Preheat oven to 350 degrees. If you're starting with full sheets of graham crackers, crush them either in a food processor or in a ziplock bag with a rolling pin. 3. For the pie filling: Preheat oven to 350 degrees. In a large bowl, combine condensed milk, sour cream, lime juice, and 1 TBS lime zest. Mix well (I used a whisk, then spatula) until creamy and smooth. 4. Pour the filling into the cooled graham cracker crust. Bake for 5 to 8 minutes (I baked for 5). Do not brown! Chill thoroughly before serving and topping with whipped cream. 5. For the whipped cream: With an electric mixer on high, beat 1 cup heavy whipping cream and 1 and 1/2 TBS sugar until stiff peaks form. This will go faster if you first pop the bowl and beaters in the fridge or freezer for a bit before you start. Store cream in the fridge in an airtight container. 6. To decorate, either slather a layer of cream on top of the chilled pie or make dollops: Spoon whipped cream into a plastic baggie and use a scissors to trim one of the bottom corners. Pipe dollops of cream along the rim and center of the pie. Sprinkle with lime zest. While your center dollop of cream might be way off like mine, this pie overcomes looks with heaps of yumminess. My coworkers (birthday girl included — phew!) went back for seconds and kept thanking me profusely. Yep, they sure are lucky — lucky I can follow a recipe! With a pie this easy and delicious, I'm convinced anyone can become a baker. Why not give it a whirl? How have I never blogged about Sparrow Collective before? It's a wonderful little boutique in Milwaukee, brimming with handmade wonders by over 100 independent designers from all over the country. These designers bring printed tees, handcrafted jewelry, unique clothing for kids and babies, art prints, cards, and funky little gift-ables. I've been shopping at Sparrow Collective for over a year now and never fail to find something worth gifting. Maybe that's why I haven't blogged about it yet — it's like my little present-shopping mecca that I'm subconsciously trying to keep all to myself. Time to fess up. In the past year, I've brought home Milwaukee-made candles, a necklace with "MKE" stamped on a tiny brass heart charm, a duo of potted knit cacti (adorable), cards with cats in silly costumes, and a bumper sticker that says "Sweet dreams are made of cheese." What have I been ogling lately at Sparrow Collective? They're big on air plants set in earthy, clay vases and hanging bowls. Scattered throughout the store, you'll find moss terrariums with tiny figurines or gemstones nestled in the greenery. Among the many items of clothing for men, women, and children, there are soft sweatshirts and Milwaukee tees, summery Frida Kahlo tanks, and the cutest baby clothes. Pretty plates with botanical prints adorn the shop walls — so lovely! Flipping through the crates of art prints, there are works by local artists, including one of my favorites: Katie Gamb. There's also a solid selection of Milwaukee, Wisconsin, and up-north themed décor and trinkets. Really, when in search of a gift, why not start by shopping local? Sparrow Collective is filled with gems. Here are other places to shop local in Milwaukee. Happy gifting! Break out the grill — these are the best! So far this August, it's like all I've done is eat. But that's not something you'll ever hear me complain about. These spinach and feta burgers actually came from a Penzeys spice brochure — go figure! Since discovering this scrumptious recipe a few summers ago, it's become a summer staple in the Lawler house. Cook 'em up on either an outdoor or indoor grill — they're delicious either way. Technically the recipe calls for Penzeys Fox Point seasoning (a shallot and chive mix), but we use Penzeys Sunny Paris seasoning (which also boasts shallots and chives) at my house. If you don't have either of those, peruse your local spice aisle to see if you can find something similar. But you can find these spices on Amazon even, so really there's no excuse — get the good stuff! 1. In a frying pan, heat olive oil over medium heat. Add the minced mushroom caps, garlic, chopped onion, and chopped spinach, and cook until the liquid is mostly gone and the onions are lightly browned (about 7 minutes). *Note: To easily mince/chop the veggies, pulse in a small food processor. 2. Remove the pan from heat. In a large bowl, combine the veggie mixture, ground meat, mayo, bread crumbs, Worcestershire, seasonings, and feta. Use a fork and/or your hands to mix well. Form into 4 to 6 burger patties. 3. Cook on an indoor or outdoor grill until the meat is thoroughly cooked, about 8 to 10 minutes at medium heat, turning once. *Note: These burgers are very tender, so be careful when turning them. Using half-turkey, half-beef will help them stick together better, but they're still prone to crumbling. Handle with care! Serve on a bun (or just on a plate!) topped with roasted cherry tomatoes (recipe below) and crumbled goat cheese. Chop the tomatoes in half or quarters, depending on size. Chop a few cloves of fresh garlic. Toss tomatoes and garlic with a generous drizzle of olive oil, salt, and pepper. Line a baking sheet with foil and spread the tomatoes into one even layer. Bake at 400 degrees for about 10 minutes (just check 'em and make sure they don't burn). If eating these burgers sandwich-style, I like to toast the bun and spread a thin layer of mayo or goat cheese before piling on the patty, roasted tomatoes, and grilled onions. Others in my family still go for ketchup and mustard, but the flavor of these burgers is so good, why mask it with everyday condiments? I also enjoy these burger patties sans bun with a side of tomatoes — simple and so scrumptious. My friend Maria, whose cabin we visited last weekend, has bushels of raspberries growing on her property. She begged us to help her use them up, as there were just too many. How's that for a charming problem? Rachel and I were happy to oblige with some raspberry scones, and who better to turn to than America's Test Kitchen? There's even a video, which we found to be extremely helpful. The Test Kitchen uses blueberries, but we subbed raspberries of course. Some things to note: You have to freeze two sticks of butter, but only need 10 TBS total. Make sure to work the dough as little as possible, quickly kneading and folding only about the number of times the recipe calls for. Cut any larger berries into smaller pieces before incorporating (the berries aren't incorporated until the very end so they don't bleed all over the place). To reheat the scones, place in a 375-degree oven for about 10 minutes. You can also make the dough in advance and refrigerate it overnight or freeze it. 1. Heat oven to 425 degrees. Remove half the wrapper from each stick of frozen butter and grate the unwrapped ends on the large holes of a box grater, until you have 8 TBS grated. Put the grated butter back in the freezer until you need it. Melt 2 TBS of butter and set aside. Put berries in the freezer until needed. 2. Whisk together milk and sour cream until combined, then chill until needed. In a large bowl, whisk together flour, 1/2 cup sugar, baking powder, baking soda, salt, and lemon zest. Add frozen grated butter and toss with your fingers until just coated. 3. Add the milk mixture to the flour mixture, folding with a spatula until just combined. *Note: Watch the video — they do not mix the dough much at all. It will be crumbly and floury. 4. Transfer dough to a generously-floured work surface (your counter or a cutting board). Dust dough with flour, flour your hands, and knead the dough 6 to 8 times, until it just holds together in a ragged ball. Add flour as needed to prevent sticking. 5. Use a rolling pin to roll the dough into about a 12-inch square, adding more flour as needed. Fold the dough into thirds like a business letter (watching the video helps! ), using a bench scraper or spatula to unstick the dough from the countertop. Then fold the short ends into thirds to form an approximate 4-inch square of dough. Lightly dust a plate with flour, transfer dough to the plate, and freeze at least 5 minutes. 6. Transfer dough from freezer back to floured work surface and roll into about a 12-inch square again. Sprinkle the berries evenly over the surface of the dough, pressing down gently so they're embedded in the dough. 7. Using a bench scraper or spatula to unstick one end of the dough from the countertop, roll the dough into a log. Press together, tuck the ends of the log, and gently flatten the top (watch the video). 8. Using a sharp, floured knife, cut the log into four equal pieces. Cut each piece diagonally to form 2 triangles (you'll have 8 triangles total). Transfer the triangles to a baking sheet. 9. Brush the tops of the scones with melted butter, then sprinkle with sugar. Bake at 425 until golden brown, 18 to 25 minutes. Check that the bottoms are slightly golden, too. Cool on a wire rack for about 10 minutes, then dig in! Scones are involved. There's no way around it. But these turned out so fluffy and flaky, it was well worth the effort. Working with Rachel to make these made all the difference — it goes much faster with two! Plus, we cheered each other on as we attempted to fold and roll the dough — a scary task in the moment. Next time I'd love to try these with blueberries as the original recipe suggests. Or I might just slather the scones in blueberry sauce. Either way, with a basic scone recipe this good, you can't go wrong. The Café at the Plaza turned me on to blueberry sauce — that stuff was divine, but I think they've since changed their recipe (bummer!). When we decided to make the Pioneer Woman's lemon-blueberry pancakes (so good!) for breakfast during our up-north weekend, I decided it was time to finally try my hand at homemade blueberry sauce. I worked from a recipe on My Baking Addiction. Of course I used lemon juice and zest as the recipe calls for, as well as vanilla extract. But for extra-special flavor, I added some almond extract and cinnamon, too. The flavor in this sauce is just so wonderful, I could easily have taken a spoon to this beautiful batch of bubbling blueberries. Well, confession: I did just that — many spoonfuls. It's a miracle any of this sauce made it to our breakfast table. 1. In a medium pan over medium heat, combine the blueberries, 1/2 cup water, 1/2 cup sugar, and 2 TBS lemon juice. Stir frequently and bring to a low boil. 2. In a small bowl, whisk cornstarch and 2 TBS water until dissolved. Slowly stir cornstarch into boiling blueberries, taking care not to crush the berries. Simmer until the sauce thickens, about 5 minutes. Ever since making this sauce, I'be been daydreaming other ways to use it. You could pour it over plain pancakes to take them to a whole other level, or use it as a spread for scones or biscuits. You could somehow thicken it and make a pie. Really I just wish I could have a batch of this sauce on hand, always. It's just that good! The last time I spent a weekend at my friends Maria and Kevin's cabin up north, there was lots of snow and lots of homemade food. When we decided to do the same weekend summer-style, there was still lots of homemade food. But there was also sunshine, nature, and dogs in heat. Here's a photo recap of summertime in the North Woods. Celebrating friends who are almost-thirty. Taking nature walks in the Flambeau Forest. Lazing about, sipping summer water & studying Enneagrams. Indulging in blueberry sauce and raspberry scones. Letting Gia photobomb everything because she's so pretty. Playing bags at sunset during a North Woods Birthday Bash. Planning for the next up-north weekend to be sponsored by La Croix. Also deciding Gia should be a dog model.